Creativity in business matters more than ever before. Luckily, there is a new technique called gamestorming that uses games to encourage creativity in business. The old approaches like workshops, brainstorms, off-sites or hiring a consultant to think for you are no longer enough to create the new ideas that you need. Execution is still vital to bring products to market, but if you don’t have a good idea to start with, then you’re stuffed. You can use games and play to introduce people, create new ideas and even to prioritise, cull ideas and select the best ones. I recently gave a presentation on Gamestorming to a group that are advocating for mobile working, digital nomads and creativity called Anywhere Working. The group are facilitated by the team at 33 Digital and David Clare was kind enough to invite me to get involved. I was presenting on behalf of one of the collectives that I’m involved in called Converge+UK. Converge+UK is all about creativity at the intersection of design, business and technology so it was great to share some ideas with the Anywhere Working crew. Rueben Milne had a great take on the ways that creativity can happen in unexpected places and at unexpected times. Brainstorming was invented in a particular context that does not exist in every business. The earliest brainstorms were held at advertising agency BBDO in the 1940s to encourage creative teams who normally only worked on one account to get involved across the whole agency. Brainstorming was popularised by the design firm Ideo in the 1990s. 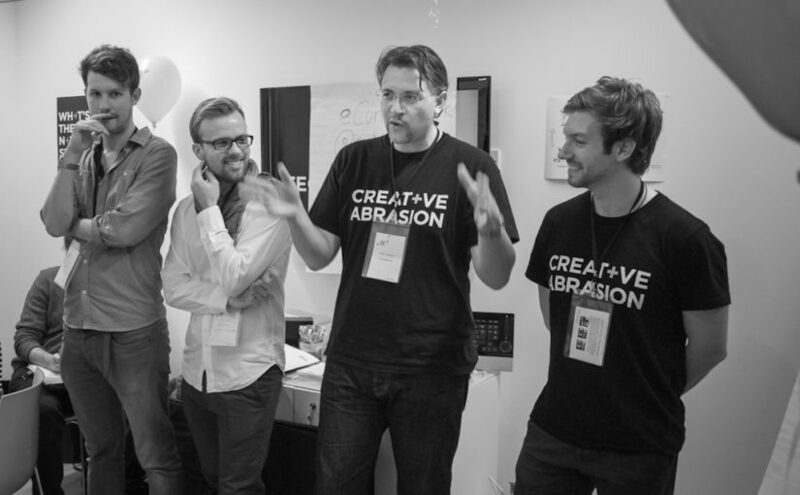 Like BBDO, Ideo has an agency filled with people who specialise in creativity for a living. Gamestorming adds rules, structure and momentum to the brainstorming process. The loudest voice in the room often wins. This can be a problem of personalities or of hierarchy. Certain type-A personalities can dominate a brainstorm for no particularly good reason. In some companies, a junior employee is unlikely to suggest an idea that contradicts a senior. Follow up is often delegated to the most junior person in the room as a simple note-taking exercise. This is ridiculous given that the whole point of the brainstorm was to generate valuable ideas and to act on them. It’s easy to say “defer judgement” and that “no idea is a bad idea” but disagreement, debate and discussion can be stressful for people. 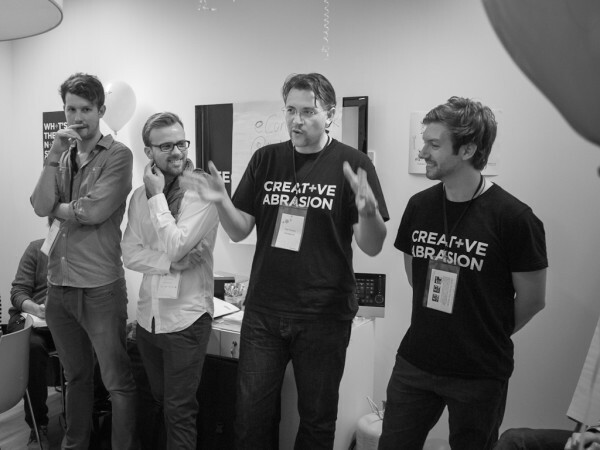 In Converge+UK events we use the term Creative Abrasion alot to describe the process of healthy debate. But not every company has a culture where it’s safe to disagree with one another. So maybe it’s time for new approaches to creativity in business. We need new creativity techniques that are more fault-tolerant and more fool-proof. Because often the people that most need creativity techniques are the most likely to mis-apply them. Several creativity consultants (including Ideo) have been experimenting with new techniques for creativity. The 2010 book Gamestorming by Dave Gray, Sunni Brown and James Macanufo codified the “play” approach to creatitvity into a set of underlying techniques (meta-rules) and individual games that can be used to attack different creativity problems. So, what are the elements of a game? When we watch children play is isn’t long before they’ve invented a way to compete (even if only good naturedly). Somehow, competition is at the heart of playfulness. But our adult world doesn’t cope well with the good-natured, friendly competition that creates play. We are trained into either kill-the-other-guy competition or wimpy everyone-agrees co-operation. The task of rediscovering adult playfulness is about how we can rediscover competition, play and fun. Another thing that makes a game exist is the boundries that define the game itself and the players in the game. The boundaries give direction and momentum to the game. At the core, a game doesn’t exist without rules. We might not always like the rules, and it’s fun to occasionally break them. But the rules create the game. The rules for gamestorming vary depending on the chosen game. This makes gamestorming more flexible than brainstorming. For the rules to keep the game moving you need a referee or an umpire. This person can then apply the rules in a more flexible way to create the best game. 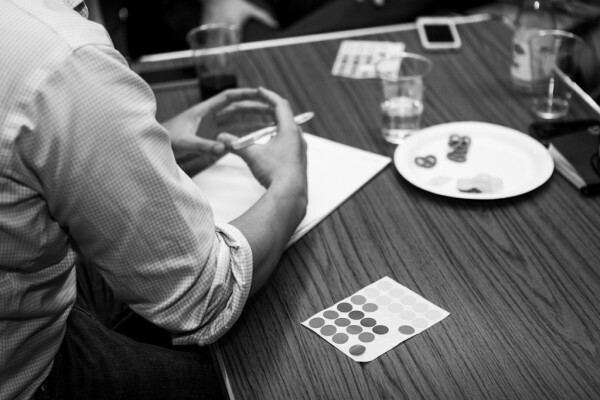 A facilitator smooths out play in gamestorming. In brainstorming, the post-it notes and flipcharts are just nice prompts for creativity. Whereas in gamestorming, the props are used as the playing pieces. This means that they are integral to the game itself. Depending on the game, you may be moving the pieces around, trading them or even hiding them around the room. There are several types of game that you can use to encourage creativity in a business setting. You can use games to introduce a problem, to break the ice and to relax a group of people together. You can use games to diverge the thinking on an issue, collect lots of ideas, explore a few new perspectives and try out different approaches. Finally, you can use games to converge towards preferred options, a conclusion or a shared story. Marshmallow pasta tower: This game challenges groups of participants to create the highest tower of pasta that can support a marshmallow. It’s good for breaking the ice and getting groups to work together. But don’t mistake this “Introduction” game for a “Diverge” or “Converge” game. What would person xyz do? : This is a fun game for divergent thinking. Basically, you find famous, historical or fictional characters and approach your business situation from their perspective. It’s usually a shared narrative game but the competitive element comes from the banter and one-upmanship of coming up with the most outrageous thing that Napoleon Bonaparte (or any other chosen character) would have done to launch your new T-1000 widget. Elevator pitch mix and match: This game uses the template with slots for target customers, pain, product, benefits, competition and points of difference. It’s fun to play because you can mix and match the slots to create new combinations. Too much marketing sounds like buzzword-bingo so this game challenges participants to come up with lots of bad ideas in the hope of sparking a good one. One hundred points to barter: This game helps converge on preferred solutions, features or priorities. You give each participant 100 points to spend. They then barter, negotiate and bribe to allocate as many points of their own and other people’s to their preferred feature set. It’s a good game for bringing scarce resources back into play. Gamestorming is an artform that takes time to learn but the basics are surprisingly simple. The crew from Microsoft, Nokia and Intel’s joint Anywhere Working initiative asked me to summarise the concept with 20 slides in 5 minutes. The format is like Petcha Kutcha where the slides advance automatically every 15 seconds. Next time you are confronted with a last minute invite to a poorly organised brainstorm, then look for a chance to turn it into a game. The first step will be to reintroduce a healthy dose of competition, energy and fun. Gamestorming is also very well suited to bringing together different disciplines because the games have their own momentum and no-one gets left out. Gamestorming won’t replace execution of an idea but you’ll be in a much better starting position if you start with a good idea. Or lots of them. Just a heads up. Sunni Brown just released a new book called The Doodle Revolution: Unlocking the Power to Think Differently. It’s a prequel to Gamestorming and I think you might find it very helpful. Check it out and let me know what you think.